Two cases out of the United Kingdom are causing great concern for the freedom of speech. Earlier this year a Christian street preacher in England, Mike Overd, was convicted for quoting Leviticus 20:13 as a condemnation against homosexuality after a homosexual complained to police. The judge reasoned that since Leviticus 20 doesn’t just condemn homosexuality, but prescribes the death penalty for it, the preacher was inciting violence against homosexuals (even though Overd claims he did not quote the portion of the text calling for the death penalty). He even added that he would have avoided a fine had he quoted from Leviticus 18:22 instead since there is no mention of the death penalty for homosexuality in that passage. Islam is the second largest religion in the world, and growing rapidly. As such, it’s important for Christians to have a basic understanding of this formidable religion, and in particular, it’s sacred text, the Qur’an. 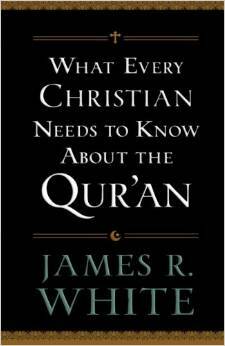 Christian apologist, James White, has written an excellent book – What Every Christian Needs to Know About the Qur’an – that provides Christians with a basic understanding of the Qur’an, focusing on the topics that divide Muslims and Christians. According to Muslims, the Qur’an was written by God from eternity past and merely dictated to Muhammad by an angel over a period of 22 years. As such, it is inerrant. The central tenet of faith for Muslims is the absolute numerical oneness of God (tawhid), and a confession that Muhammad is His greatest and last prophet. The worst of all sins is to associate anything with God (shirk), so the Christian claim that Jesus is God is shirk. If Christians firebombed every publisher that printed publications speaking ill of Jesus and Christianity, there would be few publishers and publications left. But alas, we don’t resort to violence to defend our faith. Islam is a peaceful religion, remember? It’s those fundamentalist Christians that we have to watch out for. Should Christians Call God “Allah”? A Dutch Catholic priest, Tiny Muskens, argues that Christians should begin calling God, “Allah.” Why? To ease Christian-Muslim tensions. What might God think about this? According to Muskens God is above such bickering over what He is called. Muskens was a missionary in Indonesia for 30 years, and points out how Christians in Indonesia call God “Allah.” In their language, that is the generic reference for God, equivalent to the English “God.” If they can do it, and no one has a problem with it, why can’t we do the same as well? I think Muskens’s suggestion is misguided for three reasons. First, I don’t think one can make a Biblical case that God is unconcerned with what we call Him. He has chosen to reveal Himself to us with certain names and titles. We cannot just ignore those, or interchange them with some other name if it suits our fancy to do so. For example, we can’t call Him “Xenon” because we think that’s a cool name. That is disrespectful to the God who has revealed Himself, and His name, to man. Having said that, I understand that the English word “God” is just an English translation of the Hebrew elohim. There is nothing special about the English word “God.” We could just as well use the French word Dieu, or the Italian Dio, or the German Gott…and would do so if we spoke French, Italian, or German, because that is the equivalent word for elohim in those languages. But we do not speak those languages. Likewise, we do not speak Arabic, or live in countries where Muslim influence has made it so that the only term that exists for God in the native language is “Allah.” So there is no reason for us to use “Allah” to refer to God. Second, I think Muskens’s suggestion would have the opposite effect He envisions. It is one thing for Christians to call God “Allah” in a nation whose language has no other name for God, but it a whole other matter for those who have an alternative name to begin using “Allah” to identify their God. In the former case the usage is necessary; in the latter it is not. Most Christians are Trinitarian. The triune God of Christianity is repugnant to Muslims. To call that God by the same name as the Muslim God when it is not necessary to do so, is likely to be seen as blasphemous, for it would associate Allah with a false God. That will hardly help Muslim-Christian relations! Thirdly, even if Muslims would not be offended by our change from “God” to “Allah”, what makes us think this change would ease Muslims-Christian tensions? Does Muskens think Muslims won’t be privy to the fact that the change in terminology has nothing to do with a change in our beliefs? Their problem with Christians is not that we do not call God “Allah”, but that we do not follow Islam. Calling the Christian God “Allah” will do nothing to change that fact, and thus it can do nothing to ease Muslim-Christian tensions. One final thing to consider…. Why is it that Christians need to change the word we use to refer to the Supreme Deity? Why isn’t Muskens calling on Muslims to start calling Allah, “God”? I would venture to say it is because he knows they would never do so. They would likely see it as an affront to Islam, and may resort to violence and killing like they did in the case of the Danish cartoons. It’s much easier and safer to tell Christians to change their language. Muskens knows Christians are tolerant, even of those who disrespect their religion. on a new nationwide poll of Muslim beliefs about suicide bombings, Al Qaeda, and the U.S. led wars in the Middle East. The findings may scare you.It’s not a good sign when 26% of American Muslims under the age of 30 believe suicide bombings and other means of violence against innocent civilians can be justified on rare occasions “in order to defend Islam from its enemies.” Nor is it a good sign when 5% of American Muslims have a favorable view of Al Queda. Given the fact that 60% of Muslims either deny or take no position that Arabs were involved in the September 11th attack, 75% oppose the war in Iraq, and 48% oppose the war in Afghanistan, it doesn’t take a leap to think some of these U.S. Muslims see the U.S. as an enemy. And given the fact that 5% of American Muslims (117,500 people) support Al Qaeda, and 1 out of 4 young American Muslims think suicide bombings against innocent civilians is justified to defend Islam from its enemies, we would be stupid beyond pale to close our eyes to the possibility of being attacked at home by U.S. Muslims because we don’t want to be politically incorrect. Don’t get me wrong. I’m not saying Muslims are our enemies. There are many good Muslims who are pro-America, and would never think of doing anything to harm us. But there is obviously a viable minority among us who think otherwise, and we can’t shut our eyes to that fact. To do so would only be to our own peril. Check out this video showcasing a televised debate between Wafa Sultan (Arab-American psychologist and secularist) and a couple of Muslims on Al-Jazeera TV, broadcast back on February 21st 2006. Sultan was obviously speaking from somewhere in America based on how bad she let her opponents have it when it came to the Muslim religion. She made some very good points that are worth hearing. It’s a 5 ½ minute video. A German court on Thursday convicted a businessman of insulting Islam by printing the word “Koran” on toilet paper and offering it to mosques. The conviction comes after a Danish newspaper printed cartoons depicting the Prophet Mohammad — sparking violent protests around the world from Muslims who saw the images as sacrilegious and an attack on their beliefs. Manfred van H. printed out sheets of toilet paper bearing the word “Koran” shortly after a group of Muslims carried out a series of bomb attacks in London in July 2005. He sent the paper to German television stations, magazines and some 15 mosques. The maximum sentence for insulting religious beliefs under the German criminal code is three years in prison. While this may not be happening in America, it is happening in a Western nation where they are supposed to value freedom of speech and tolerance. While I believe Manfred’s actions were foolish, being jailed for them is just plain scary. More and more we are seeing people being censured in Western countries from criticizing other religions (besides Christianity of course, which is always fair game) or homosexuality. I fear for the future of the freedom of speech, and the freedom of expression. The new religion in town is pluralism, whose moral code is relativism, and whose only law is the acceptance of every view as equally valid.